A green place should not only be attractive to human beings, it should also be stimulating to those of birds as they are also a beautiful part of your nature and entire ECO-system! Birds are the real voice or music of your green space! 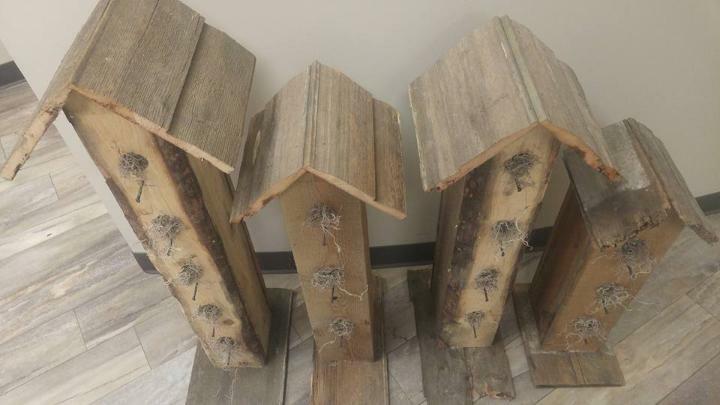 So send a call for the birds that you like to be in your green space, these DIY pallet garden birdhouses would be just amazing for sure! 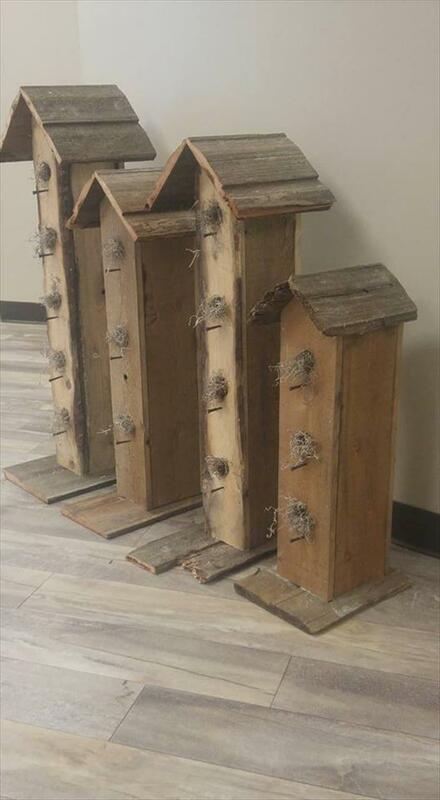 Give some effortless readjustments to those dismantled pallet pieces and build a big number of these birdhouses quite easily! 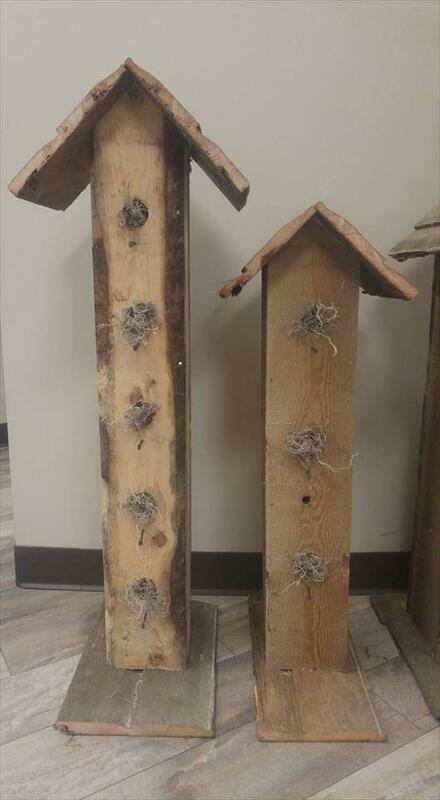 For a perfect imitation, you can add the chevron tops and also the perches to these handmade birdhouses and also make some holes to let the birds built their nests inside of them! This is another amazing use of pallets to grab the attention f garden birds and hence you would be able to meet your own favorite chirping creates right in your garden at every pleasant morning! Do make these birdhouses painted for a charming hue and also to add some fascinating colors to your green space! 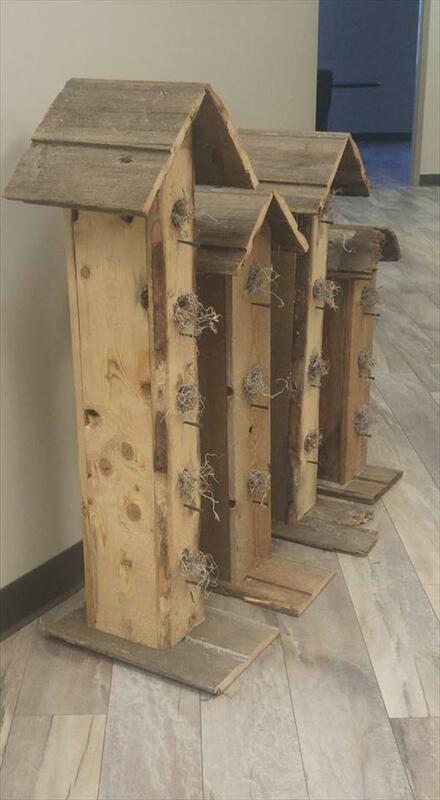 Build slim tower boxes with pallet slats and let them come on flat bottoms to give your some amazing birdhouse to place in your garden just to call your favorite birds at one place! 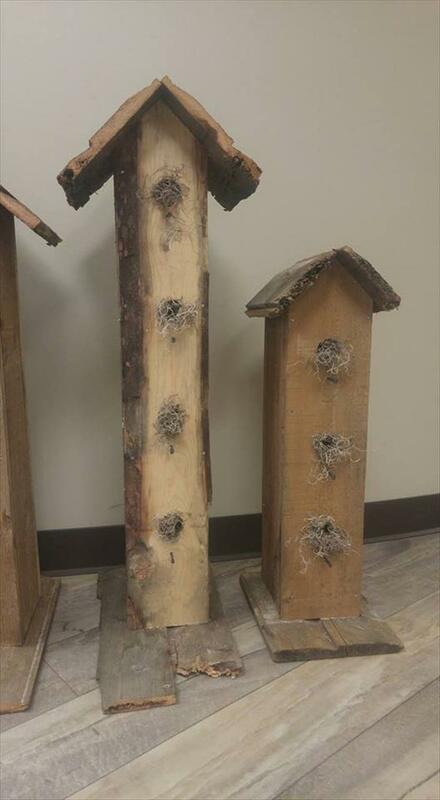 Each unique size of birdhouse comes with a line of drilled holes like buttons of a shirt, these are actually the nests to house the garden birds and also to allow them to lay eggs there! Prepare a bundle of these birdhouse and just put them around your favorite garden plants, this will highly fancy up your green space! Chevron tops will make them noticeable to birds as houses for sure! Get your garden outstanding by creating these sensational wooden birdhouses, these birdhouses are also free and lasting as well so your should grab them instantly through medium of pallets! Here flat bottoms have been installed to let these little houses stand individually but your can also mount them on garden poles and on some aloft supports!